There are some oils that I use for different purposes. Lemon oil is one that I like to use for cleaning and disinfecting but also for mood lifting purposes. 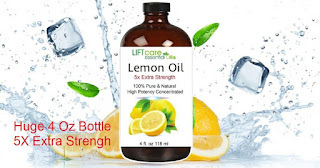 I just received a very large container of LiftCare Lemon Oil, and this is one that I will be using for Cleaning and Disinfecting purposes and also for removing gummy residue from surfaces. I'm going to be completely honest and tell you I do not love the smell of this concentrate, and will not be using it for mood elevation purposes or skin lightening purposes and it is a "cleaning only" oil for me. For less than $14, you cannot beat the 4 ounce bottle size that is great for organic, chemical free cleaning. I just add about 5 drops to and an ounce of vinegar to hot water and clean my floors with it! It leaves my house smelling totally fresh and clean! (5X FOLD) EXTRA STRENGTH Our Lemon Essential Oil is the most powerful fresh traditional lemon blend. You can diffuse Lemon Oil when trying to clear a room of the smell of the cigarette smoke and other unpleasant aroma. The HIGHEST QUALITY AVAILABLE, premium concentrate taken from the peel of ripe fruit via cold expression. HUGE 4 OZ BOTTLE-lasts for up to 60 days of daily use. More potent concentration means less drops per use. 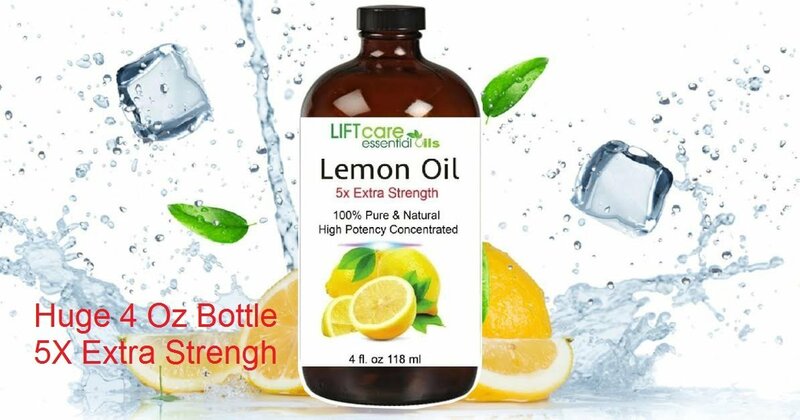 INTRODUCTORY LOW PRICE-Refreshing feelings of purity and cleanliness describe the savory fragrance of lemon oil. STRONGER AROMATHERAPY AND LONGER LASTING FRAGRANCE. Fights illness and fatigue. NATURAL DISINFECTANT-Lemon oil deploys antiseptic effects on fresh minor infections of the skin, including acne. 30 DAY MONEY BACK GUARANTEE! ALL NATURAL, NO CHEMICAL DILUTION! Lemon Oil is a potent skin lightening agent. Freckles and age spots etc.